For many people with diabetes, living with the disease requires multiple needle sticks a day to inject insulin and control their blood sugar. But in the future, diabetics might be able to take their insulin in pill-form. Two groups of researchers are working to make this possible in the future. 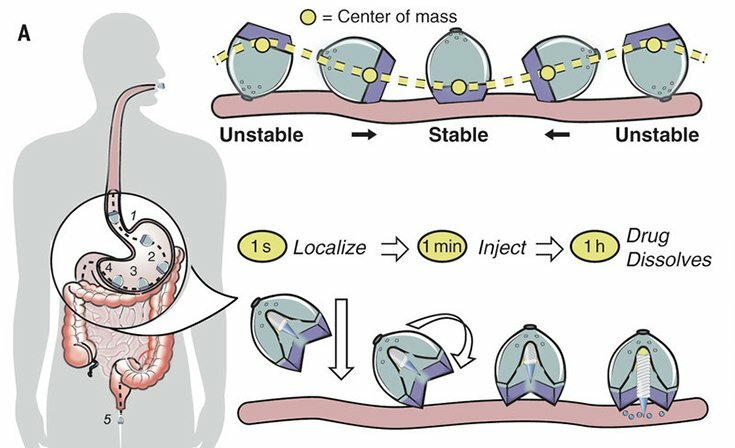 The groups, from MIT’s Koch Institute for Integrative Cancer Research and Harvard’s Brigham and Women’s Hospital, have developed an insulin delivery system that still uses a needle, but it’s so small that it can be swallowed, pain-free. The pea-sized device contains a spring that injects a tiny dart of solid insulin into the wall of the stomach, according to Carlo Giovanni Traverso, an associate physician at Brigham and Women’s Hospital. Fortunately, nature provided the solution. The researchers said in the journal Science that they’ve tested the insulin-delivery device on pigs, where it successfully injects a therapeutic dose of insulin provided the pig has an empty stomach. Both teams of researchers have partnered with the global healthcare company Novo Nordisk to prepare the device for use in humans. It could be ready for human testing in a few years.